I realize the looks of this chicken will not win any awards. I love colorful, pretty food and this dish is brown on brown on brown. In my book that is B-O-R-I-N-G. But I promise you that what this dish is missing in looks, it totally makes up for in taste. One bite of this and you’ll see – it’s like a flavor explosion in your mouth. I used the same sauce in my fried avocado recipe because I’m kinda obsessed with it and want to dip everything in it. And let me tell you, that tangy honey mustard sauce paired with smoky bacon and then add in lightly carmelized onions and mushrooms – ohmigosh, it’s an amazing combination. I can’t even put into words how ridiculously good this is. So much so, that we declared this our new favorite dinner. We like to double the sauce recipe and serve this dinner with a side salad and use the extra sauce as our dressing. So good! I hope you like it as much as we do. Whisk all the marinade ingredients together in a small bowl. Pour 1/4 cup of the marinade mixture over the chicken breasts and marinade them in the fridge for at least one hour up to 24 hours. (Honestly, I’ve skipped the marinading part a few times when I was hungry and wanted to make something fast. It’s still has amazing flavor without marinading it.) Chill the remaining marinade for later. Place the chicken breasts in a 13×9 baking pan. Salt and pepper the breasts and bake for 25 minutes. While the chicken is in the oven, cook the bacon over medium heat in a skillet for a few minutes. You don’t want to cook it completely because it will finish cooking in the oven. Add in the onion and mushroom and cook for 2-3 more minutes. Set the bacon/onion/mushroom mixture aside. Once the 25 minutes is up, take the baking pan out of the oven and spread a layer of reserved tangy honey mustard sauce over the chicken. 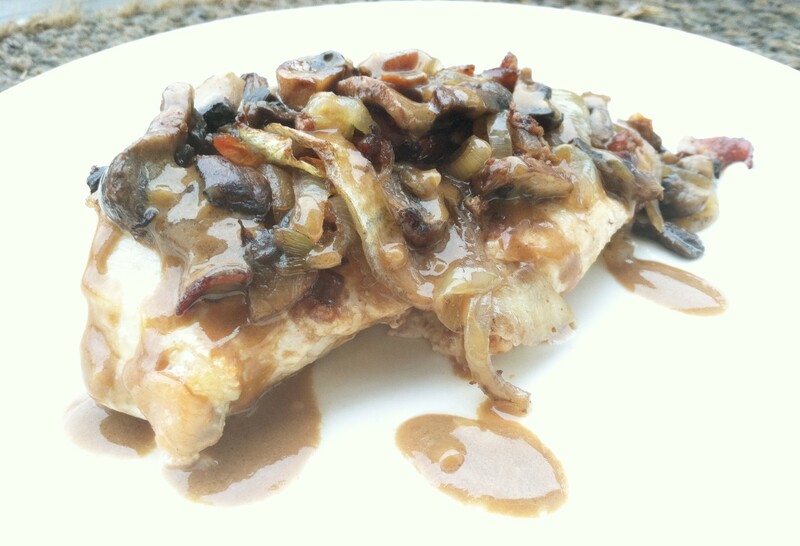 Top the chicken breasts with the bacon mushroom mixture. Place back in the oven for 15 minutes or until chicken is cooked all the way through. Top with any extra reserved tangy honey mustard sauce, if desired. Enjoy! *If you really like that sauce as much as we do, consider doubling the sauce recipe so you can have extra for this dinner, if needed. If you have any leftover, it makes a delicious salad dressing, too! Oh yes, smoked gouda or provolone would be sooo amazing on this!! LOL, so happy to hear this!! Also made your deviled eggs for Easter and they awesome also. We love bacon and balsamic as much as you do! This looks amazing. I plan on making it very soon. Do you use chicken breast with bone in or boneless? Thank you, Denise!! 🙂 You could use either! I usually use boneless because that’s what I almost always have in my freezer, but either one would work. Hope you like it! Holy cow! This is such an amazingly delicious dish! It is going on my favorite recipes list. All that bacon and onion and mushrooms in basaltic. Wow! I could drink that marinade. Next time i am doubling the marinade to have plenty for pouring over the cooked chicken. Plus, as you said, this would make an excellent salad dressing. Awesome!! 🙂 Thanks for the comment, Paula! We made this yesterday and everyone loved it! Made this for father-in-law’s birthday dinner. Delish, everyone loved it, although I did remove the topping from the kids pieces. I love your blog. I use more recipes from it than any other blog I visit. Just came across this from Just Eat Real Food on FB. I have thinly sliced chicken breasts. Does that affect the cooking time? Would love to make this tonight since I have all the ingredients! Yes, it would. Thinly sliced breasts usually only take 20 minutes in the oven. Hope that helps! Does “one onion cut in half and sliced” mean I use the whole onion? Or am I only using 1/2 of it? Thank you. This came out delicious! This looks really good! I can’t eat onion, do you have another recommendation that you think would compliment this dish well? Thank you! I have bookmarked a ridiculous number of your recipes this week. Now all I need to do is go shopping! This sounds amazing! Can’t wait to try it…just one question, what would you serve with this? Thanks, love your website! My husband is a fast eater to begin with, but I think he broke his own record with this one! So good! The sauce was amazing and this will definitely become a regular in our house. Thank you! I made this this week for dinner. I put the sauce together, skipped marinading, threw it on some chicken and then the vinegar smell became very powerful. I taste-tested the sauce to find that it tasted like a vinegar-based salad dressing and all flavors of mustard were lost. That isn’t what I was expecting or wanted so I rinsed my chicken off, and remade the sauce omitting the vinegar. I cooked this dish to completion. Without the vinegar it was great. I’d say worth repeating but I’m scared to have super vinegar-y chicken. This is in my oven right now. Can’t wait to eat it. I love the idea of eating it with broccoli too. I’m gonna serve the broccoli raw and use the extra marinade (cuz I took on good faith I’d love the marinade so I doubled the recipe) as a dipping sauce. I’m in California – I wish you and I weren’t on opposite sides of the nation cause I’d LOVE to hang out with you in your kitchen! And your home gym. And your beautiful acres out in the middle of nowhere. I’ve always wanted to visit Cali!!! 😀 Thank you so much for your comments, Trish. They seriously put the biggest smile on my face! I’m going to make you blush …. today’s been a “Kelly” day for me. I finally took your advice about high/low intensity days and DIDN’T do one of your home workouts. But I had your chai pancakes for breakfast, your chocolate chip cookies for a snack, and now this for dinner. Oh, and I made your vanilla ice cream last night, so that will be for dessert! I used a purple onion because that’s all I had. It broke up the brown and made it more colorful. Super tasty!